The Rangers won the lottery, more or less, Tuesday night when it was announced that they would be selecting 2nd overall in this year’s NHL Entry Draft. This pick will pave the way towards building the next Stanley Cup contending Rangers team – the addition of Jack Hughes or more likely Kaapo Kakko will give the Blueshirts that elite homegrown talent they’ve been lacking for so long, and will accelerate a process that many feared would go awry, somehow. Before the lottery, General Manager Jeff Gorton announced that he would have a good luck charm with him, but only revealed that it was the late Steven McDonald’s shield after everything was said and done. The Rangers organization made perhaps the classiest move imaginable in doing so, because it will inextricably tie Detective McDonald’s legacy to the Rangers’s destiny going forward and in the process immortalize everything he stood for. Steven McDonald was a hero, but so often something that gets lost in the shuffle are the reasons why. There is of course no right way to remember or to mourn – I certainly would never claim it as my place to decide such a thing for others – but in reflecting on his story and the deep faith in humanity that binds the narrative there’s something truly profound there. To me, what made Steven McDonald deeply heroic was the forgiveness he extended in the aftermath of the shooting that left him paralyzed. Despite being robbed of so many precious moments, he was still graceful and kind in the way he responded to his attacker, and the foundations of that grace can teach us something. In opening up about the challenge and eventual triumph of forgiveness over hate, Steven McDonald spoke of the way he realized he would never truly heal with resentment in his heart. His Catholic faith, the belief that something terrible could become something beautiful, implicates an appreciation for what is over the painful yearning for what might’ve been. In this process of rebuilding, we can learn something from the joy he felt in watching his beloved New York Rangers and his ability to appreciate life no matter what. We can learn to count our blessings and to love the experiences we’ve had even if we still haven’t quite made it there. We can go into this coming era with the mindset that every day we spend watching hockey is a gift, and we can refuse to be blinded by either success or failure as we journey onward. I remember distinctly when Det. McDonald asked “where would you rather be?” I remember the cries of joy that erupted at the Garden during his tribute. 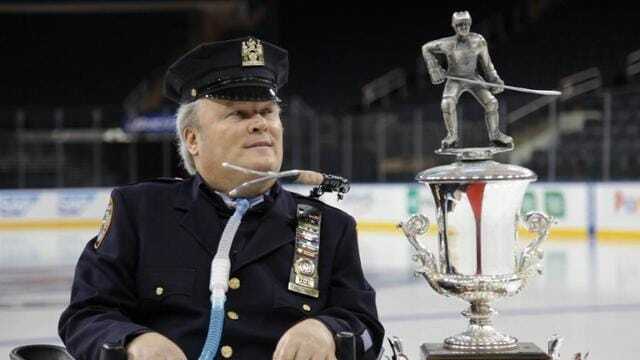 Most of all though, with Steven McDonald’s help, I’ll remember community, happiness, and the love the New York Rangers are capable of inspiring. There will be stories told of the end of the Henrik Lundqvist era, the beginning of the Kaapo Kakko era, and maybe even the overlap between the two. There may be stories of absolute victory, or stories of falling short, but those stories will start, one way or another, with Steven McDonald’s name and everything he stood for. It’s a new and exciting time for the New York Rangers. Let’s remember though what it’s all about, the reasons why and the ways how Steven McDonald is still with us and always will be. It’s a point of pride to love the same team he did. Let’s go Rangers, now and forever. "It Starts With Steven McDonald", 3 out of 5 based on 4 ratings. Steven McDonald never died, he just went to a better place, as his faith tells us. He also went to the hearts of many who knew of him, his love of our team, and the award named after him. His spirit lives, because he was the good luck charm that gave us Kakko, so we all should thank him. Long live Steve, he will never be forgotten!!!!!!! Pat, That was a beautiful tribute and spot on. He should inspire us all. The forgiveness he showed is second to none. Not sure I could have done it. Someone wise once said, and I live by this, “hate only corrodes the vessel in which it is carried”. God bless Steven and his family, he was the very definition of what it means to be a hero.